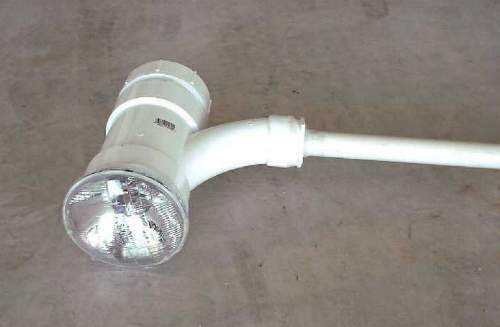 First the light: Made with a high-beam automotive headlight, 4" PVC, and 1" PVC handle. Not very heavy...not too much battery draw. See bottom of page for materials and directions for construction. Now the cooler. This thing is TERRIFIC for holding the battery (full size auto battery), a case of beer, and your spoils from gigging. 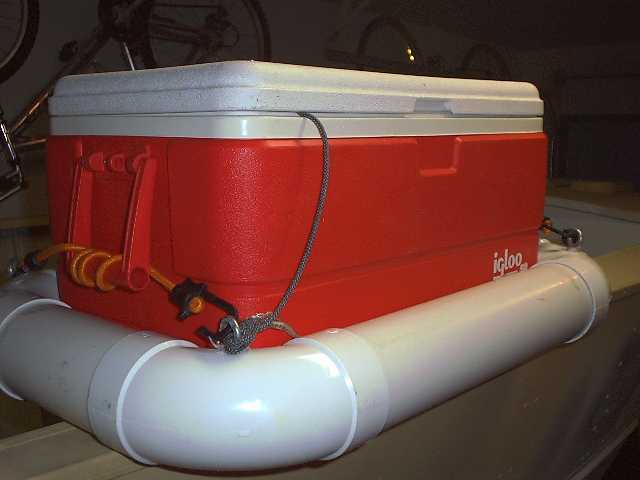 This is a 50 qt cooler that floats in about 2 inches of water fully loaded with all of the above. 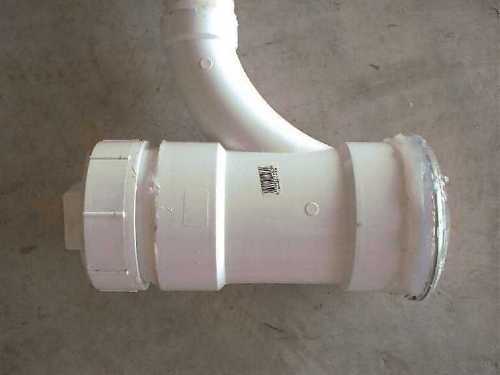 Also made with 4" PVC sewer and drain pipe. I use this every time I go wadefishing or gigging. It is extremely handy! Simple to put together also. Hope this helps someone out. Feel free to email with any questions or comments. 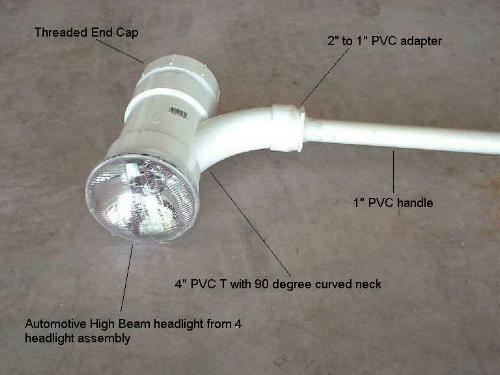 Since I have had so many requests, I have included materials and directions for constructing this gigging light. * Not needed if you can find a 4" PVC T with a 1" neck, but all I could find were 2" necks and a 2" PVC pipe would be uncomfortable to hold for any period of time. **This length can be adjusted to your needs. Figure 5 feet to the top of the PVC handle, then however far your battery is from there. I drag my battery about 10' - 12' behind me in the cooler. You can use much less if you carry your battery in a backpack. Pretty simple to put together. Feed the lamp cord through the neck of the PVC T and out the front where the light will be. Attach the positive and negative cables to the post and silicone to a depth of at least 1 inch around the entire post. Put a thick bead of silicone around the end of the PVC and push the headlight against it firmly and position the headlight where you want it. Go ahead and prep the adapter and the neck of the PVC T. Apply PVC glue and attach the adapter to the neck. Remember that PVC glue dries in 30 seconds or less. When you push the adapter in, give it about a 1/4 turn to set the glue. While this sets a bit, pull out the PVC pipe for the handle. Drill a 3/4" hole near the lip. Pull the lamp cord up through the handle and attach the toggle switch to the wire that will attach to the positive battery terminal only. The negative will remain untouched. 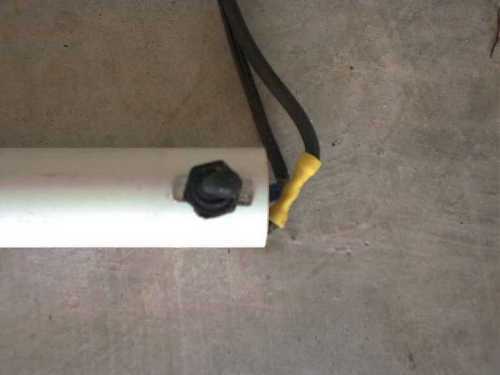 Attach the toggle switch to the PVC handle and screw on the rubber cover. By now the silicone and the PVC glue should have set up a little bit. Pull out the silicone and apply a thick bead around the back of the headlight by going through the opposite side. When finished, prep that end and the threaded end cap. Apply the glue to both and screw it in tight. You will probably need a large wrench to screw it in tightly because this glue stiffens up quick. Two things to note here: Instead of gluing, you can apply a thick bead of silicone all around the cap in case you want to get to the back of the light in the future. Also, I thought about adding a second light on the backside instead of the threaded cap. That way you can see the rays swimming behind you! ;) The only reason I didn't is that I was worried about battery draw. With an automotive battery, you would probably be OK with two, but definitely not with a motorcycle battery. Prep the PVC handle and the inside of the adapter and glue these two. When finished, silicone around all connections with a thick bead. Silicone around the outside of the headlight with a VERY thick bead, then silicone around it again the next day. You can't use too much silicone!! Attach the quick connect clamp to the positive side of the lamp cord and screw the ground side down on the battery terminal. Clamp the positive onto the battery terminal and check it out. This light gives tremendous distance underwater, plus it is like having a 1,000,000 candlelight spotlight if you lift it out of the water. I have found many good coves using this as a spotlight!